ICS Technology offers the WX400 a modular Video Wall unit /digital signage product enabling you to control multiple screens displaying a single source in unique configurations. The WX400 gives you the ability to display one DVI or DVI dual Link image across up to four screens in any 90° configuration that you require. This is ideal for corporate lobbies, advertising, trade shows etc. WX400 also offers additional add-on products to enable you to daisychain multiple WX400 units to achieve larger and more unique Video Wall presentations. You can configure the output screens in any 90° position. Each screen can be controlled separately. 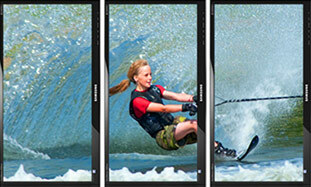 The image that is displayed on each screen can be resized or cropped to achieve your desired results. WX400 also offers additional add-on products to enable you to daisychain multiple WX400 units to achieve larger and more unique Video Wall presentations. WXdL8 brochure download link below.